Rangers boss Stuart McCall has urged his side to cut out sloppy mistakes as they head for a "thrilling" Championship season finale. 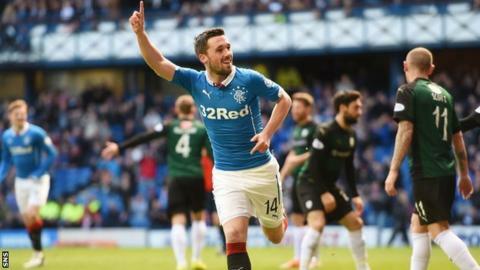 They beat Raith Rovers 4-0 on Sunday to stay third, behind Hibernian on goal difference. Whoever finishes second will face one fewer play-off game. "I think we can still do better," McCall told BBC Radio Scotland. "I thought there were periods in the second half where, because it was 2-0, we were a bit sloppy and casual." Hibs, who have played a game more, beat their already promoted Edinburgh rivals Hearts 2-0 to maintain their narrow advantage over the Ibrox side. The division's third- and fourth-placed teams will meet in the first round of the play-offs, with the winners playing the second-placed team. Whoever emerges victorious from that two-legged encounter will face the second bottom side in the Premiership - again on a home-and-away basis - for a spot in the top flight. McCall continued: "We scored some good goals and got a clean sheet, so there are things to be pleased with. "But I still think we can be better. We have everything to play for. Hibs needed to win that and they have done. "All we can focus on is ourselves and it's going to be a thrilling finish between now and the end of the season." Former Motherwell boss McCall has been in charge of Rangers for seven games, winning four times, drawing twice and losing once. Rangers play their game in hand against Livingston at Almondvale on Wednesday and McCall hopes his young players continue to put in encouraging showings. Robbie Crawford played at right-back in the win over Raith Rovers, while Andy Murdoch and Tom Walsh got more game-time. McCall added: "Crawford's never played right-back in his life but I just felt that I'd seen him in the under-20s at left-back and he's got a lot of energy. He put in a terrific shift. "Murdoch doesn't surprise me any more because he's been putting in performances like that week in, week out. He's consistently been very good for us. "It was nice to get Walsh on the park as well after being out with his hamstring. It's always promising when you see the youngsters doing well."